When you work with Renewal by Andersen® of Greater Philadelphia, you’ll be working with the exclusive supplier of Renewal by Andersen® windows to Philadelphia, Havertown, Ardmore, Chester, and Camden NJ. That means our window company has the benefit of more than a century of manufacturing experience and a factory trained staff that has a deep expertise in every product we install. Our replacement window process has been honed down to an exact, reliable science that always finishes on time and on budget. And each product we install is backed by an industry-leading warranty. Prior to hammering a single nail, a Renewal by Andersen® of Greater Philadelphia professional will visit your home to measure your existing windows or doors. Any variables in your specific window installation will be noted, and when we return we will be fully prepared to promptly install your new windows. The Renewal by Andersen® of Greater Philadelphia truck that rolls up to your home will be fully equipped for your installation. Everything the installers need for your window or door project, including a power supply for their tools, is inside. While inspecting your job site, our window installation team will take note of any furniture or valuables that needs to be moved in order to protect them from our construction process. Before beginning the installation, they will move these items to a safe, secure area and then begin removing your existing windows or door. Using a pry bar and hammer, our installation technicians will remove your existing windows, taking care to protect your drywall. If your older windows are aluminum, we will recycle them for you. Once your old windows are out, your new ones will be removed from the truck and brought up to the house. Any changes that need to be made to the opening where your old windows used to be in order to create a level plane for your new windows will be made. This ensures that your new windows will open and close correctly. There will be a gap between the edges of your new windows and the frame of your house. Our Philadelphia and Ardmore area replacement windows experts will seal the gap with insulating foam designed specifically for Fibrex® windows. The foam creates an airtight seal that will keep your home draft-free all year long. The insulating foam serves its purpose, but it is not exactly aesthetically pleasing. Our window installation professionals will fit an aluminum trim, designed for your unique windows, to cover the foamed area. The combination of the two will create a weatherproof seal that is easy on the eyes and will resist cracking, warping, rot, and mold. After vacuuming and generally cleaning our work area and replacing all of the items we moved at the beginning of our process, we will remove the plastic film that covers your new windows upon installation. When we finish our job, you won’t be able to tell we were there, save for the beautiful new windows! You can request a free window or door consultation and receive additional information about our products by calling our toll free number 610-563-2190. 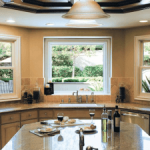 For windows and doors replacement, call the Philadelphia, PA and New Jersey window company you can trust!